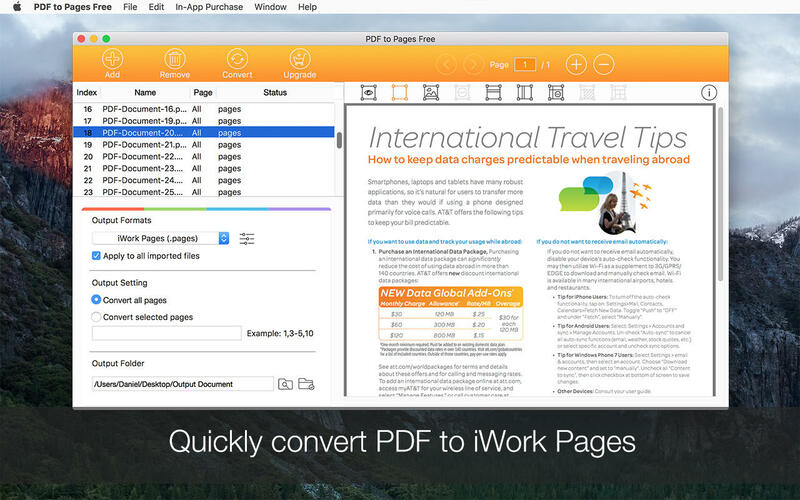 Turns your PDF files into iWork Pages quickly and accurately. Work more effectively with PDF to Pages converter. PDF is good for sharing and achievement, but it’s never an easy task to modify PDF. With PDF to Pages Free, you can quickly convert PDFs into well formatted .pages files and edit them in Pages app. **This is a Lite version, it only outputs 3 pages for each PDF conversion. It preserves the original formatting as accurate as possible, text content, images, multi-column, tables and even the most complex formatting can be well retained. So you don’t need to spend lots of time adjusting the output pages. PDF to Pages Free can convert unlimited PDFs in extremely fast speed. You can convert only particular pages to free yourself from unnecessary waiting. Flexible output options for different output formats, you can even mark table or graphic areas for better accuracy before conversion. You can mark table area, add columns and rows, merge and split cells, so it can handle the most complex table data conversion. Convert a 100-page PDF file within a minute. Extremely fast. * Support PDFs in multi-language, English, German, French, Italian, Portuguese, Spanish, Russian, Chinese and most of the languages around the globe. This version doesn’t have OCR function, so scanned or image-only PDF will be converted into image in Pages file instead of editable content. We’re constantly improving our apps, and we value your opinions and feedback. If you want to send us feedback or have a problem with our apps, please contact us at support@lightenpdf.com before submitting a comment to the app store. We’ll try our best to solve most of the problems, but we are not able to respond to comments.